As beautiful as they look, glass fences are quite easy to maintain too. Once installed, cleaning a glass pool fence is a relatively pain free process. In this article we will run through our recommendations for maintaining and cleaning your glass fence panel. Regular cleaning: Regular cleaning means less build up and a quick and easy clean. Clean it often, with warm water using a soft microfiber cloth or sponge to get the simplest dirty away. It is recommended that you clean the glass every 3 months. However the more you do it, the better it will look. Keep it simple: General glass cleaners may leave unwanted residue on your fence that become highly visible in direct sun light. Simple soap and water with a sponge on the glass panels will do just fine, the same way it works while cleaning glasses or plates. Clear away the soap suds by simply washing it away with good clean water. Let it dry: After you are done washing the glass panels, dry it with a clean washcloth. Alternatively, you can let it air dry. The results will be just the same. Stay vigilant: It is a good idea to spot clean any bird or animal droppings as soon as you spot them. They can be very erosive to the glass and hardware. If the idea that glass balustrades and fencing are hard to clean was what keeping you from getting one, maybe it’s time you let that go. However you choose to keep your glass clean, you will be happy knowing it does not take much time or effort to do it. In fact glass fencing is actually one of the easiest types of fencing to maintain. At SN Fencing, we proudly offer a range of pool fencing solutions, with expert advice to ensure homeowners everywhere have access to a high quality service at an affordable price. 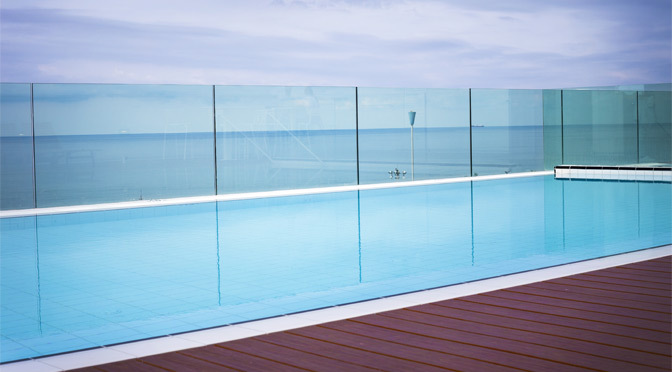 So, if you are looking for a quote, or simply need some advice on your glass pool fence maintenance, have a chat with our expert team.